How long does Sure Step last in Florida? Your video indicates the Sure Step product last for a season. In Florida, our "season" lasts year round. When should the Sure Step product be re applied in our conditions? 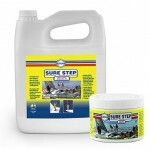 Sure Step generally lasts up to 6 months although many boat owners in tropical areas re-apply it every 3 to 4 months for maximum protection against sun damage. Initial application requires pre-cleaning with Boat Clean Plus and Boat Scrub and 2 coats of Sure Step. If you re-apply more frequently than the 6 month period and providing that the decks are kept fairly clean, re-application can usually be done with just washing with Boat Clean Plus and a single coat of Sure Step. Just be careful if there is aggressive cleaning with Boat Scrub to remove scuff marks and bad stains. In those cases you will require 2 coats of Sure Step again. Boat Scrub contains Hypusine which can penetrate into the pores of the gelcoat and remove the Sure Step that is functioning as a sealer. The reason for 2 coats is that the 1st acts as a sealer land the 2nd as a top coat.